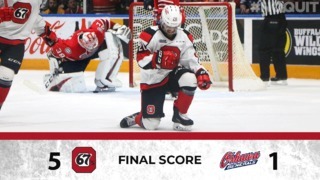 After the holiday break the boys return to The Arena at TD Place to host the Niagara IceDogs on December 28th at 2:00pm. With both teams missing players due to the World Juniors, here’s who you need to keep an eye on when the East’s top two teams square off. Last season Tye Felhaber averaged 1.03 points per game. 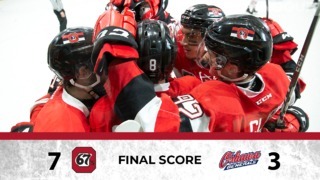 Halfway through this season, the 67’s averager is averaging 1.08… GOALS per game. The 20 year old came into this season focused and has netted 38 goals in 35 outings so far this season which sees him leading the league. Already having eclipsed his previous career high of 31 goals, Felly has also added 18 assists to bring his point total to 56 which puts him in fourth overall in league scoring. To add to that Felly leads the league in Plus/Minus at +31 and leads the CHL in first goals with 12. Felly comes into Friday’s game on a nine game goal streak, with 14 in that stretch. 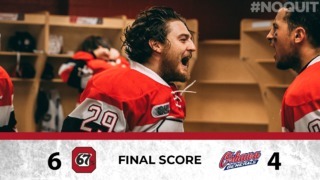 Every time Tye gets the puck the 67’s have a change of picking up a goal, he’s definitely one to keep an eye on. The only player in the league Top 5 Plus/Minus not a member of the Ottawa 67’s, Thomas sits in fourth with +24. The 18 year old and second round pick of the Los Angeles Kings is having a career year so far this season. A playmaking centre, Thomas has 11 goals and 31 assists in 27 games so far this year for a total of 42 points. Scoring at a clip of 1.56 points per game, barring a shutout it’s likely that Akil will register a point in some fashion on Friday afternoon. Although left off this year’s World Junior team and invite roster – Thomas has represented Canada before, most recently at the 2017 Hlinka-Gretzky Cup (then Ivan Hlinka Memorial) alongside 67’s defenceman Kevin Bahl. Tickets for Friday’s game start at $20 (special ticket price that includes a beer) and tall cans of Bud and Bud Light are only $7 until the end of the first period. Click here to get your tickets.